Single gas monitors have toxic gas sensors that use an electrochemical (voltametric) sensor or a polarographic cell to provide continuous analyses. In operation, sample gas is absorbed on an electrocatalytic sensing electrode after passing through a diffusion medium. An electrochemical reaction generates an electric current directly proportional to the gas concentration. •	Develop controls for exposure in the form of engineered safeguards, work practices, safety plans, and work zones. The ToxiRAE Pro is the world's first wireless personal monitor for toxic gases and oxygen. 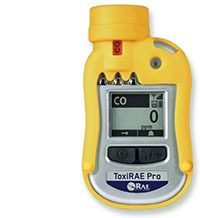 The ToxiRAE Pro can detect a broad range of gases – from carbon monoxide, hydrogen sulfide, and oxygen to ammonia, chlorine, and formaldehyde. The ToxiRAE Pro provides safety professionals wireless remote access to real-time instrument readings and alarm status for better visibility and faster incident response. The ToxiRAE Pro's intelligent interchangeable sensors store calibration data, which allows users to monitor for one gas one day and another gas the next, by simply swapping the sensors in the ToxiRAE Pro. The ToxiRAE Pro LEL is the world's first wireless personal combustible gas monitor. The ToxiRAE Pro LEL takes worker protection to the next level by providing safety professionals wireless access to real-time instrument readings and alarm status from any location for better visibility and faster response. 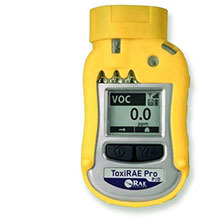 The ToxiRAE Pro PID is the world's smallest volatile organic compound (VOC) monitor. Featuring RAE Systems' next-generation PID sensor, the ToxiRAE Pro PID can quickly detect and accurately monitor over 300 VOCs. The ToxiRAE Pro PID provides safety professionals wireless remote access to real-time instrument readings and alarm status for better visibility and faster incident response. With an onboard library of 190 correction factors, the ToxiRAE Pro PID can be programmed to automatically read in equivalent units of the specified compound. The ToxiRAE 3 is a full-featured personal single-gas monitor that offers unequaled cost of ownership value. 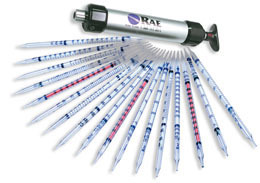 The ToxiRAE 3 is compatible with the AutoRAE Lite bump and calibration station. 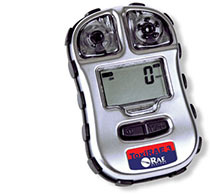 The detector features a 2 year warranty and can record STEL, TWA, high, and low alarms. The ToxiRAE Pro CO2 is the world's first wireless personal carbon dioxide monitor. It provides safety professionals with wireless remote access to real-time instrument readings and alarm status for better visibility and faster incident response. The ToxiRAE Pro offers datalogging capability and is equipped with a "Man Down" alarm and policy enforcement to ensure greater safety while making sure compliance-related procedures such as periodic testing and calibration are performed.